This a handcrafted, genuine leather 3/4" wide Cuff/bracelet. Handmade 1-1/2" - 38 mm Wide Genuine Black Leather studded Wristband with Silver/Chrome Buckle & Pyramid Studs bracelet Rock Made in U.S.A. 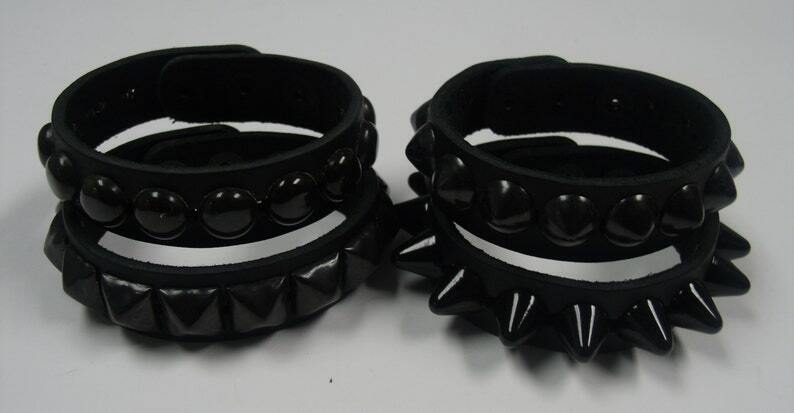 Handmade 1-1/2" - 38 mm Wide Genuine Black Leather studded Wristband with Silver/Chrome Buckle and Bullets bracelet Rock Made in U.S.A.